Four persons including a school principal, a teacher and a student have gone missing when a boat capsized at Ekgal Oya in Damana this morning. Police said a group of teachers and students of the Kandana Siri Seevalee Vidyalaya in Badulla, had taken a boat ride at Ekgal Oya at around 6.45 this morning when they met with the tragedy. 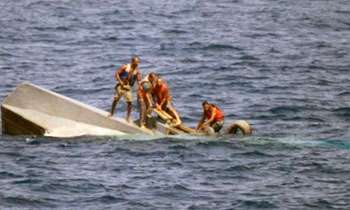 They said nine persons were in the boat when it capsized and five of them were rescued by the fishermen in the area. Police had commenced a search operation for the 53-year-old principal, 43-year-old teacher, 13-year-old student and 33-year-old watcher who had gone missing.